Choosing a good phone is not an easy thing to do. Price always matters and we always end up sacrificing one good feature or more. Good phones come in the shape of a flagship and they are oftentimes too expensive. Budget phones exist unfortunately, they only offer a good camera and not enough battery life or the other way around. We can’t seem to have the best of both worlds, especially in the budget phone department. Good thing, those days are now over. And luckily, Motorola has created the phone that meets all of our needs. And yes, that beast is the new Motorola Moto e5 Plus. Whether you game or vlog, this phone should be number one on your list. Want To Permanently Sim Unlock Your Phone From MetroPCS? For starters, it has a 12MP rear camera and an 8MP front camera, but that’s not the most amazing thing about the Moto E5 Plus. It has a whopping 5000mAh battery! For a budget phone, this is definitely a road less taken, and Motorola Moto E5 Plus is a certified trailblazer. This phone also comes with 6” HD display meant for less scrolling, more fun, and wider gaming screen. Camera and battery life? 100! You got the beast and the beauty all in one phone. 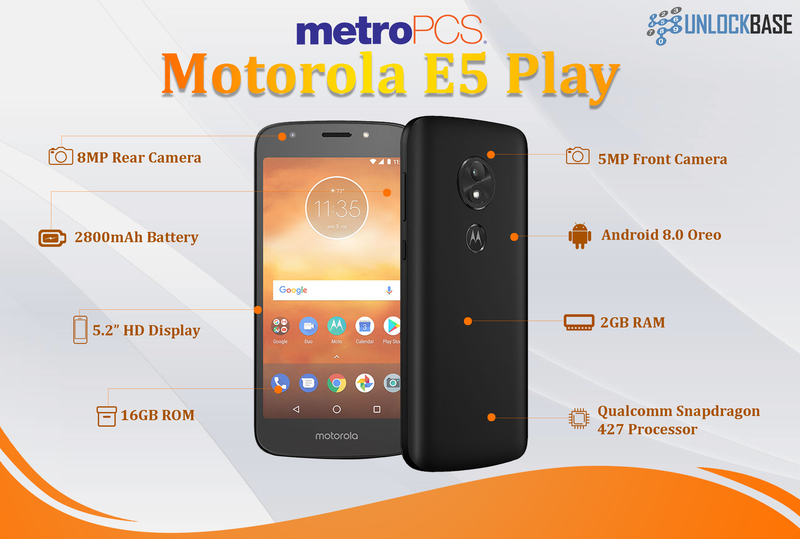 You’ll never have to compromise about the specs and the price, because you can get this phone from MetroPCS for only $49 if you port over. The phone comes locked to them, but you can easily have a temporary or permanent unlock using the Device Unlock App. You’ll never be sorry buying the phone outright because it’s only sold for $209. This phone will always come handy for when you are travelling. Say goodbye to the not-so-nice sight of charging in the airport or losing battery when you are lost in a new city. You will never have to look for an outlet and charge every hour just to make sure you have enough power until you arrive at your hotel. For a gamer, a huge battery is great, but having a huge RAM is even better. Well, the Moto E5 will never disappoint you with a 3GB of RAM and 1.4GHz Octa-core processor. This beastly phone will give you both the power and the speed even for an entire day of gaming. And the phone is designed with an ergonomic weight; it looks and feels so compact you can’t even tell it has a huge battery in it. Though it has a big battery, charging for 6-8 hours is not necessary because you only need 15 minutes to use it for another 6 hours non-stop. All thanks to the TurboPower charger on board. You can also unleash your vlogger-wannabe side with this phone. The 12MP Rear Camera with laser autofocus technology can help you capture sharp, bright, and livelier photos or videos in an instant. Whether you are shooting inside your room or in any dark places, this phone will still encapsulate all the beautiful details of your selfie in the best light because of the 8MP front camera that has its own LED flash for the low-light environment. Now, you don’t have to worry about blurry pictures, you can take them anywhere and anytime! Though it is truly a big phone, it still comes handy and can be use with one hand because it has a slim design that can fit in your pocket or palm. The 6in edge-to-edge screen is packed with a Max Vision display that will help you enjoy the “crazy-wide” landscape view. One of the things we so love about the Moto E5 Plus is the fingerprint scanner. You don’t always see a budget phone that offers all of these convenience! If you think that’s all that this phone can offer, well, there’s more to that! Both the Moto E5 Play and E5 Plus are water-repellent; you don’t have to worry about a little splash of water. Don’t get it wrong for being waterproof, this phone can handle sprinkles, but not submersion to water. Nonetheless, it makes it more amazing isn’t it? Getting Unlock Errors? Here’s A Complete Guide On How To Troubleshoot It. Moto E5 Plus has more in store! If you plan on taking a lot of photos, this phone can house all of them. It is packed with a 32GB internal memory and has an expandable external memory of up to 128GB via microSD. Last but not the least, this phone runs on the Android 8.0 Oreo operating system. You get to enjoy all the beautiful features the new Android system has to offer, like a split screen when you have to do too many things like play and text people at the same time. Now that’s what you call a phone! If you want this phone, grab one through MetroPCS and enjoy the life without worries. T-Mobile Revvl Plus: Is This Budget Phone Truly Revvlutionary? The year 2017 has been a golden era for budget phones, and T-Mobile for sure did not let the opportunity go. 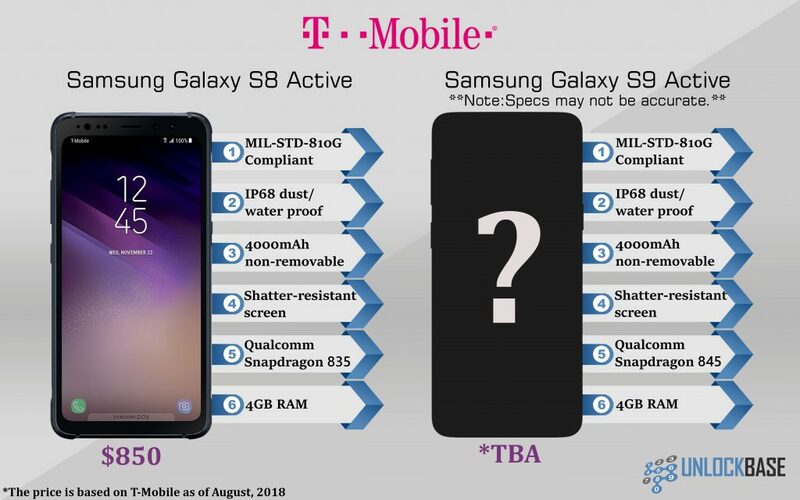 And on the last quarter of the same year, the T-Mobile Revvl Plus was born; a huge 6-in phablet, and one of the first devices under T-Mobile’s own line of smartphones. But, is this $175-phone even worth considering? Well, you might want to give this phone a second look because we found out that it offers high-end features you would only often find in branded flagships. Do you want to permanently unlock your T-Mobile Revvl Plus? Here’s how to do it. Here’s an overview of what an almost $200-phone (after taxes) from T-Mobile gives you. To make the decision-making process easier, we compared it with another branded phone under T-Mobile of the same price tag. It’s clear that the T-Mobile Revvl Plus ticks check in almost every box, but there are a lot of things some people who had it don’t like about it. Let’s go through what the major deal breakers are when you get the T-Mobile Revvl Plus. Can you use a T-Mobile Branded Phone like the Revvl Plus with another carrier? Absolutely! This is how you do it. Here comes the compromise. 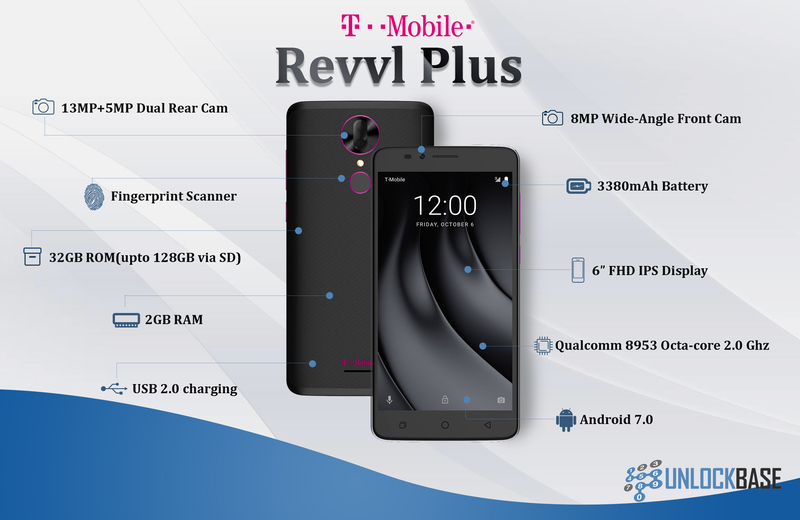 For the high-end features and fast processor, T-Mobile compromised how the Revvl Plus looked like on the outside. After all, aren’t we all concerned about the usability of the device at the end of the day? However, a lot of people still value looks and being flashy as much as they do about speed and quality, and yet the majority of budget phones are designed this way. And if you are planning to get a pretty phone like the Samsung Galaxy J3 Star instead of the Revvl Plus, you might be compromising a handful of better features along the way. Having a budget phone doesn’t ultimately mean having an ugly-looking one, because if you are willing to spend a few bucks more you might just get a better-looking phone with similar specs just like the LG Stylo 4. The phone’s design is not that bad after all. It has a touch of fuschia, the same as the brand’s color, and it comes with a fingerprint sensor, ergonomically located at the back. For a $200-phone that’s a plus. If this is not the reason why the Revvl Plus only got 2.5 Stars from T-Mobile Customer reviews, we don’t know what is. A lot of people complain about the speed of the device, but since this is a budget phone, one should always manage their expectations. The 2GB RAM on this phone makes it possible to run a heavy gaming app, but that doesn’t guarantee there will be no lags or hiccups. Since this is one of the very first phones from T-Mobile, it is expected that certain system glitches or bugs may still be unsolved. Also, the phone comes with a lot of heavy bloat apps already, so not all of that 2GB RAM is ultimately usable; only a part of it is, and that could affect the phone’s overall performance. Another deal breaker is the phone’s Operating System. It still runs on Android Nougat, and that means you are losing a handful of helpful features that is only present on the latest Android System Oreo. With Oreo, you can have multiple displays, so you can split your screen and do two things at the same time, seamlessly. Oreo also has updated auto-fill features making it easier to login without typing in so much information. Using this phone for social media and other related tasks should go very well, and multitasking on this phone should go smoothly as long as you are not running very heavy apps in the background. You hardly ever get cameras this nice under a $200 price, but T-Mobile even got us a dual-rear camera! This phablet also comes with a huge battery that can last you all day! The phone comes with a huge screen, but it is neither too heavy nor too light, giving it a premium feel on your hands. Want to permanently unlock your T-Mobile phone for another carrier? Let us help you! For the price, this budget phone is really worth considering. The phone is packed with a powerful processor, a huge battery, and a good supporting RAM for a much better performance. It may have compromised the looks, but T-Mobile made sure to make the overall eperience on this device better than most budget phones you would find in the market. Unlocking LG K30: Is This Phone The Best Budget LG Yet? Here at UnlockBase we like to show you a comparison between phones of the same brand, and this time, it’s LG’s turn. 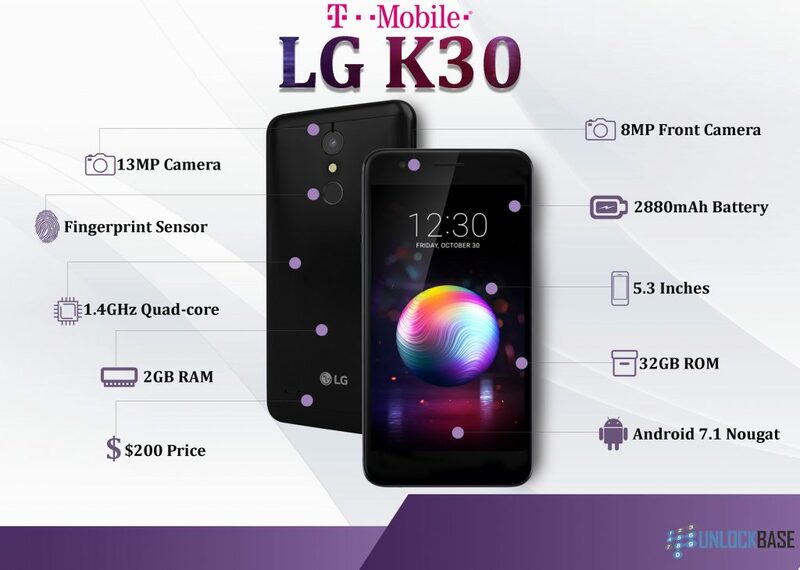 On the spotlight is LG K30 (X410TK), a new phone from the Seoul-based brand exclusively offered via T- Mobile. We’ve had quite the feedback, so today, we are taking a look at how this specific LG phone compares to its brother phones which were also released this year. To differentiate, the LG Stylo 4’s unique selling point is the Stylus, the LG Q7+ its performance and protection, and the LG K30’s its price point and simplicity. It is one of the most affordable LG phone this year, yet it still has premium features we would not usually see on a phone within its price range. Do note that the above-mentioned phones come from different families of devices under LG. This means that they were created to be an improved version of their predecessors, and for the LG K30, it is the LG K20. For the Stylo 4, it’s the Stylo 3, and so forth. That being said, each family of devices was created to have its own unique selling points, so our considerations for this article lies solely on the premise of practicality these phones serve and the selling point to which they are offered. In case you are torn which among these T-Mobile budget phones you should be getting, we made a table to ease the decision-making process for you. Cons No other features to offer. Not much improvement since LG Stylo 3 Camera can be improved. 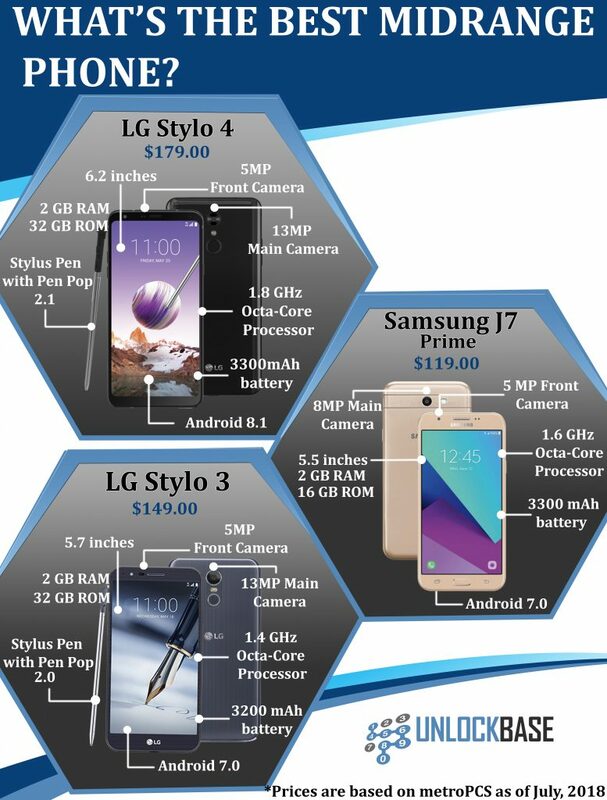 The table above shows the major features that you will actually be paying for the device you are going to get. It is clear that LG K30 is pretty much a decent device for the price it is being sold for, however, we don’t think it is worth the compromise. If you are going to pay another $39 bucks, you can get a much bigger phone with a much bigger battery size, the LG Stylo 4. Also, the LG Stylo 4 has an additional feature, the Stylus pen, which is pretty much comparable to that of the Samsung Galaxy Note 8. On the other hand, both the LG Stylo 4 and LG K30 has the same amount of ROM/RAM power, which essentially means they are comparably as fast as the other, but the LG Stylo 4 has a much more powerful 1.8 GHz octa-core processor. It means that multitasking on this phone is fast and is more power efficient compared to the LG K30, but if you’re doing just the typical type of tasks, this difference in speed will probably go unnoticed. There’s no question as to why the LG Q7+ seem to have more value because of its higher price. But for a mid range phone with that price tag, it is no doubt worth every penny. It is one of the few mid range phones that has IP68 water and dust resistance, packed with premium LG sound features comparable to the brand’s flagship. Although LG K30 seems like an unwise choice for a budget phone compared to other LG budget phones, you might find it a better option compared to other budget phones from other brands in the same price range. T-Mobile also offers Samsung Galaxy J7 Star, and it currently retails at $225 when paid in full, the phone has a slightly bigger screen and slightly better camera than that of the LG K30, but it doesn’t have a fingerprint sensor at the back. The Un-Carrier also offer Moto E5 Plus, which retails at a higher price but comes with a fingerprint sensor and a much superior processor. It has a gigantic 5000mAh battery but it did have a few features compromised. The phone seemed to be very heavy and it has a low-resolution display, the cameras weren’t great, but they are not that bad either, but we are certain you’ll like the LG K30’s camera better. For the price, we think that the LG K30 is worth the penny, but if you are willing to spend a little more, you can actually get a better phone with a much faster processor and a better camera. But if you’re a solid LG K-series fan, this phone surely is an up-game compared to the LG K20 in so many ways. We sure wished it had something more to offer especially that there are a lot of competing budget phones in the market, but it seems that LG K30 has given way for other LG phones to shine. Do you own an LG K30 from T-Mobile? Care to share your experience with us? That was a pun right there, but anyways, we’re not kidding when we say that this phone is really smart. The thoughtfulness of the creators and designers of this phone is even beyond genius. Here are a few reasons why. Using Google Lens this phone gives you the ability to search the web by simply focusing your camera on whatever thing or place you want to learn about. It gives you smart suggestions based on web search results and information. The feature makes shopping and traveling easier and more efficient. For an avid online shopper, this is ultra-convenient. For a wanderlust, it makes getting lost a learning adventure. You can access Google Lens through the Google Assistant button on the left side of the phone. Launch the Google Assistant by pressing once, and quickly double press to skip to the Google Lens. There are many reasons why this flagship is called a ThinQ, and the AI Camera is one of them. With this intelligence on board, you will have an extra ‘creative eye’ that provides you with real-time and easy recommendations on how to better enhance your photo. The camera automatically detects low light shots (in dark or poorly lit areas) so it adjusts the amount of brightness needed for you to get the best pictures. The best thing about flagships are their camera, and LG surely didn’t let us down. It has two rear cameras, one is a wide angle lens, and the other is a standard angle lens with apertures of f/1.9 (LED Flash) and f/1.6 respectively. You can have a portrait mode that lets you have a bokeh background effect or wide-angle shots that lets you capture beautiful scenery or a group of people. There are several camera modes to choose from, such as the Manual photo mode that lets you change ISO, shutter speed, white balance and more. Just like in previous models, you can also choose between 17 pre-set cinematic filters. There is a whole lot more to discover with the LG G7 ThinQ’s camera that you couldn’t possibly ask for more. Hi-Fi Streaming. Reads MQA file. High-resolution audio streaming. 32- bit Hi-Fi Quad DAC. For crisp, out-of-the-world sound experience when you are listening to your wired headphones. Hi- Fi Video and HD Audio Recorder. It has 2 high AOP microphones that record audio in higher quality. You have 3 different mode options depending on the sound you like when recording audio on a different track. In line with that, you can also minimize Wind noise when recording a video. Your mics are also combined to the phone’s receiver to record better sound quality even in loud and noisy environments. Super Far-Field Voice Recognition. It recognizes and amplifies your voice even when you are not near it or when it is noisy around you when you are taking a call. Boombox speaker, DTS:X 3D Surround Sound. These are two different features but they work as one. This is LG G7 ThinQ’s most unique selling point. The Boombox speaker feature uses the phone’s internal space as a resonance chamber that results in an amplified bass and louder sound. This is further improved by the DTS:X 3D Surround Sound which makes it more consistent and rich. It has a custom equalizer as well. The 7.1 Channel also brings cinematic effect to its sound. The LG G7 ThinQ is going to win every audiophile’s heart. For a phone with all the above features, we would rarely expect more but LG just doesn’t stop there. This flagship phone can withstand unbelievable conditions such as the Samsung S8 Active which retails for a $100 more. It is MIL-STG-810 Compliant which means it can withstand accidental drops. It is IP68 water and dust resistant so it can withstand up to 1.5 meters of water submersion. It also has a dedicated heat pipe that prevents the heat from being trapped and damaging the processor. This phone just like most flagships has a huge 3000mAh battery that can last you all day even under heavy usage. The large battery is complemented by a Qualcomm Snapdragon 845 2.8 GHz Processor + 1.7 GHz Octa-core, so you rest assured of fast and efficient use of power. It is of course running in the latest Android System (Oreo). It is wireless charging capable, and has a USB Type-C charging port as well. It is Qualcomm Quick Charging 3.0 supported so you can rev up in just a few minutes. ROM is 64GB expandable up to 2TB. RAM is 4GB ideal for heavy usage and can handle multi-tasking seamlessly. With a peak brightness of over 1000 nits, this phone would let you still see your screen clearly even against direct sunlight. The LCD screen also makes the screen really crisp, with images undistorted even in its peak brightness. Moreover, it is 30% more power efficient than the LG G6, the flagship predecessor. The screen also has a Palm Rejection feature that prevents you from accidentally pressing any buttons with the highly sensitive touch screen. We think that LG G7 ThinQ is deserving of its name, and buying one is definitely buying into an experience. For $750 it has offered way more thoughtfulness in design and feature than many flagship phones that retails for almost $1000. Surely, this one is one if the best Android flagship phones we’ve tried so far. Is LG Q7+ (Q610MA) – The most superior mid-range phone of all? MetroPCS has graced us with 4 different new phones for the month of August, and among them is the LG Q7+ (Q610MA). It is a mid-range phone, with a $329 price tag but only $99 after store credits when you port over to MetroPCS. Unsurprisingly, this phone is also available on T-Mobile. The price tag is surely very light (given that it’s being sold in MetroPCS) but the technical specifications and the features of this phone are on par even to that of the iPhone X. Let’s see why this phone maybe your next one (even if you are previously a diehard iOS user). Let’s dig deeper, shall we? 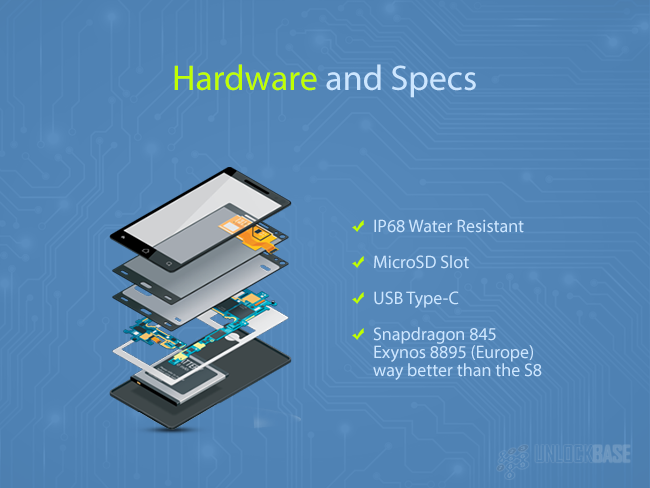 Have you ever heard of a budget phone with IP68 water and dust resistance? 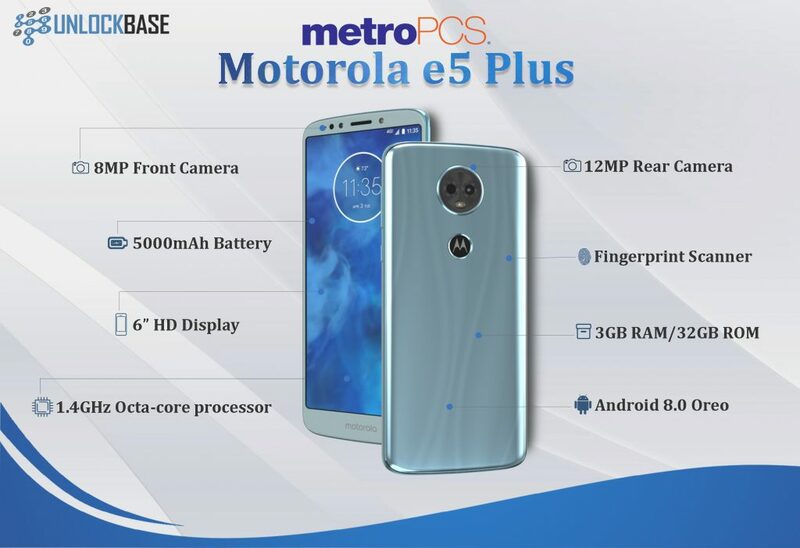 Probably not, because this is the first MetroPCS phone with IP68 level of water and dust protection released this year. And probably the only one from MetroPCS so far. There is another mid-range phone with a similar water and dust resistance, HTC U11 Life which was released earlier this year, but it came with T-Mobile and not MetroPCS. It had IP67 water and dust resistance which means the LG Q7+ is far more superior than it was for that specific matter. The LG Q7+ has curved edges which they say are 2.5D arc glass, which makes it easy and premium to hold at the same time looking like the iPhone X, although smaller in size. For just a fraction of the price of the flagship high end phones, you can get the same feature and quality without spending as much. We are sure you’d want the LG Q7+ permanently sim unlocked so you can sport this on all your travels. If you are thinking whether this phone has sacrificed the speed and accuracy for the price, you can consider yourself wrong. This phone doesn’t have the biggest screen, standing only at 5.5 inches despite the competitions going for 6 inches recently. But there is a reason for that. Not only do phones with big screens eat up too much power for screen time, they are also very difficult to use single-handedly. The convenient size of the LG Q7+ make it easier to take selfies with just one hand, type, and socialize without getting busy on both. The size is chosen for ergonomic reasons more than its effect on battery life. Other than that, it has a Full HD + Full Vision 18:9 Display which means your screen lets you enjoy full viewing experience. You can take photos with portrait mode with its 16MP rear camera with f/2.2 aperture. The front-facing camera is 8MP and has f/1.9 aperture. It can record video in 1080p quality. 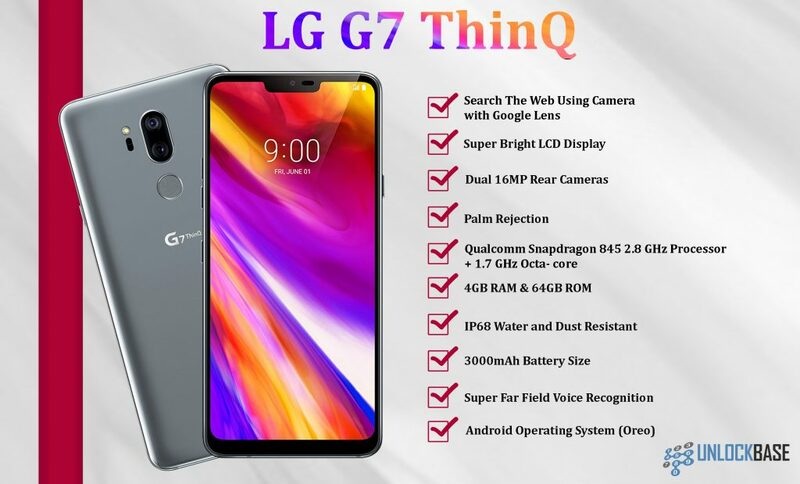 It is important to note that this phone also has DTS:X surround sound just like LG G7 ThinQ, the brand’s flagship released May this year. The price is of course twice as much since the latter is a flagship, but the sound experience is the same. With the DTS:X surround sound feature, you will enjoy a more immersive, richer, and louder sound experience than any phones you will find for the same price. There is also a fingerprint sensor located at the back, and it is also a quick shortcut button to take photos, to scroll through notification bar controls, and to even take screenshots. The phone’s Q Lens also lets you use your camera for search, and provide smart suggestions. This makes online shopping an easier task. Just point your camera at something and your phone will provide you information. 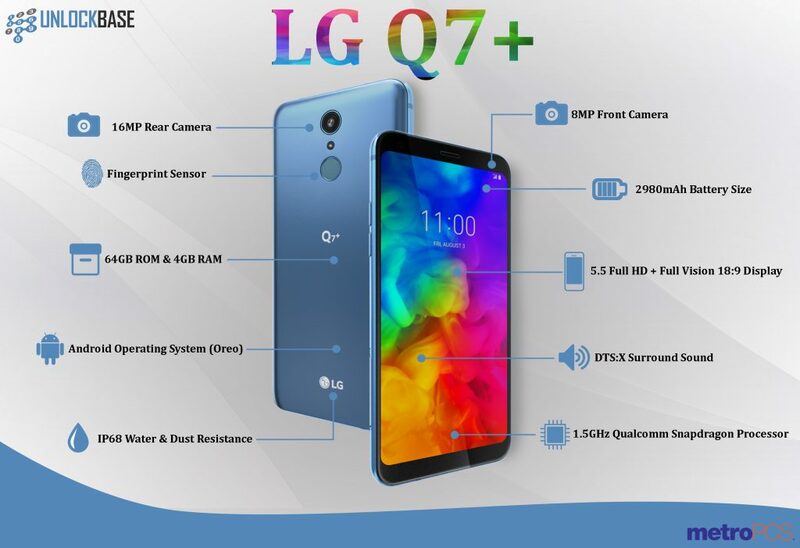 The LG Q7+ packs a huge 64GB of internal memory and 4GB of RAM which makes the fingerprint sensors work faster and the overall multi- tasking experience seamless. It runs on the latest Android (Oreo) Operating System so you are assured that all the latest security and bug updates are all in. It also has a powerful 1.5GHz Qualcomm Snapdragon processor making the overall package complete. With all of that in, you can play games, run data-heavy apps, and do much at the same time. The only caveat on this phone is the battery size, which is only 2980mAh. So even with a fast processor and the latest Android system the phone may not last a day if you use a lot of heavy apps. But with a fast charging feature it is as easy to recharge and get the power you need in just a few minutes to use your phone for the rest of the day. The LG Q7+ is a mid-range phone with premium features you can only find on a flagship. With a FullVision Display and DTS:X surround sound feature, you will enjoy watching movies, playing games and listening to music with a more immersive experience. It also has one of the best processors and operating systems available, making the total experience with the phone seamless, and without lag. You will like the phone even if you play games and do a lot of things at the same time. Design-wise the phone is one of the best looking LG phones we’ve seen so far. And with an IP68 water and dust resistance level you can bring this phone to any adventure or travels and get the most out of it. Want to Permanently Unlock Your LG Q7+ from MetroPCS? Click here: MetroPCS Permanent Mobile Device Unlock. Alcatel 7: Are You Ready for the Best Budget Alcatel? Were you looking for a phone with a huge battery, a dual-rear facing camera, a 6-inches full HD Display with the latest Android OS? Well, look no more! Just when you thought a budget phone will always have the “budget” features, Alcatel has come up with something that will surely give your wallets and your hearts a delight! Because of all the things that you’ve been wanting and looking for are now on a phone that retails at only $179 on MetroPCS. And yes, that’s the Alcatel 7! And did I tell you you can get it at $29 if you port over to MetroPCS? The Alcatel 7 is the 8th phone released by the US-based company this year. It is their flagship phone for 2018. What You’ll Get: A huge 6in FHD screen, a gigantic 4000mAh battery, a TCL custom-built screen, 12MP+ 2MP dual rear- camera, Fast Charging, IR Blaster, and the latest Android OS. The Alcatel 7 is a sure bang for the buck. The Alcatel 7’s most underappreciated feature is the IR Blaster that lets you use it as an infrared remote control to your TV or your gaming consoles. The IR blaster is not a novelty as many other phone brands like Xiaomi and Samsung used to put this feature as well on many of their phone models. But for the added convenience, it sure makes a budget phone stand out. Aside from that, the Alcatel 7 also has a fingerprint sensor and a Face Key feature which obviously lets you add biometrics such as your fingerprint and face respectively to lock and unlock your phone. Alcatel 7 also has an upgraded screen, custom-built by TCL, a US-based award-winning Television, and consumer electronics brand. If you are used to running heavy apps or softwares on your phone, the Alcatel 7 would come off as a ‘laggy’ phone to you. But if your usage isn’t on the heavy side, then a 2GB RAM should be enough to keep your phone running smoothly. The processor isn’t the best on its department but it is not that bad either. It is running on a Mediatek Helio octa core processor with speeds of up to 2.5 Ghz. It is also running on the latest Android operating system, Android 8.1.0 Oreo. And by going with the trend, Alcatel was able to create this flagship with premium features that would otherwise be only available to high end flagships retailing 4 times its current market price. The phone screen is really big, standing 6 inches, as mentioned earlier. It’s clear that this phone is really meant for video entertainment. At the top of the screen is a front 8MP wide angle camera and the LED flash. At the bottom there are speakers and a USB Type-C port for Fast Charging. On the right hand side are the volume and power control buttons. On the left hand side you have the sim and memory card slot. And at the top is the 3.5mm headphone jack with the IR Blaster. The back cover of the Alcatel 7 is not removable, which means there’s no way to replace the battery in case it dies out. The back also holds the fingerprint sensor and sitting on top of it is a dual camera for an image with more depth. The phone packs a 32GB of ROM with only 25GB usable. Part of the phone’s memory is being taken by their featured apps such as the CloserTV and the Camera which loads a lot of Social Media features. The CloserTV app is an Alcatel-exclusive app for online streaming. It is your all-in-one place for all things streaming and cable TV so you can watch your favorite series or movies easier. This is also the reason why they partnered with TCL. The Alcatel 7 has enough features to stay connected and social. The phone compares to mid-range phones when it comes to features, although, we admit it doesn’t the best processors available on the market. But for the price, it really is worth it. If you are undecided as to which phone you’re going to get, especially now that MetroPCS just released 4 phones recently, we’ve compared the specs of each phone for you to buy. For the price, the Alcatel 7 is surely worth every penny. Do you have an Alcatel 7? Want to share your experience? Let’s start a discussion and drop us a comment! Want to Unlock Your Alcatel 7 from MetroPCS? Get it here for as low as $6.90! FASTEST TURNAROUND TIME! The lowest offer online! Get this steal deal only from UnlockBase! Click Here >> MetroPCS Permanent Mobile Device Unlock. Is the Samsung S8 Active the most rugged phone yet? It’s almost a year since it’s release and the Samsung Galaxy S8 Active still has people raving. The Galaxy Active Series started way back 2013 with the Samsung Galaxy S4, but since then it has continued to improve this flagship series into one of the best in its chosen niche. And if you haven’t been introduced to the Galaxy Active Series yet, let us take this opportunity to indulge you with a few valued facts about this “rugged” flagship. Let’s jump to the best part, the Samsung Galaxy Active Series is made for every butterfinger. And not just them: it is also for every adrenaline-junkie and outdoor adventurer you know. For starters, it has a shatter-resistant screen. Dare to drop it if you must.If you are looking for a high-end full-screen phone that can withstand every punishment you can think of, this is it. It is Mil-std-810g compliant, which means it has gone through a series of “environmental and engineering tests” according to the United States Military Equipment Standards. And for consumer electronics in particular, this includes a series of Drop tests that are 4ft high (or higher) on plywood and concrete bottom floors. Aside from the rigorous drop tests, this handset device has also gone through extreme hot or cold temperatures, immersion to water, and extreme humidity and dusts to see if there are any negative effects or impairments on the device’s condition. Do note that having passed “military standards” doesn’t mean you can bring this phone to the actual warzones or frontlines. Again, these tests are within the consumer electronics context. The Samsung Galaxy S8 Active, in particular, has a military-grade body and metal framing that is packed with a gargantuan battery (4000mAh) that can last you more than a day on heavy usage. On top of that, it is wireless charging capable. Lastly, the phone is built with better antennas (600MHz) for greater wireless coverage even in closed buildings and areas where signal usually becomes scarce for normal phones. It’s the S9 Season, so why the S8 Active? The Samsung Galaxy S9 Active is rumored to be released between September to November 2018, about the same time its predecessor was introduced last year. However, a lot of reputable tech sites think it’s not likely to be released this year due to the fact that maybe Samsung may need more time to let the other flagships work its way into the market, especially with the “slow sales” the Samsung S9 is experiencing at the moment. While we’re at it, let us tell you why the Samsung S8 Active is worth the penny over Samsung S9 Active (if it does go out). The Samsung Galaxy S8 Active and the rumored S9 Active will not have much difference on the interface, except for the latter having the latest Qualcomm 845 Processor, which helps deal with better power and system efficiency, and some most requested physical buttons that Samsung phased out ever since the S8 Active. If you are not ready to pay a whopping price to have just a slight improvement in the internal processor and a few physical buttons, the Samsung S9 active may not be the best bang for your buck. The Samsung Galaxy S8 Active is currently retailing at $850 without a contract with T-Mobile, and once the Samsung Galaxy S9 Active is out, there’s a high chance that its price is going down to make way for the newer flagship. We’ve always seen Samsung devices drop its price for the older flagships and top hefty prices on premium latest releases, so this brings no surprises to your wallets. However, since the S9 Active doesn’t have any release rumors yet at the moment, you can hold your horses until you remove any of your hesitations. But as for us, the Samsung Galaxy S8 Active stays the best unless the S9 Active gives something completely unthinkable and out-of-the-ordinary into the table. We can wait and see. So as for that burning question, is the T-Mobile Samsung Galaxy S8 Active really rugged? Well, that’s for you to decide. The “rugged” concept is, as always, subject to personal opinion. But with the facts and specs we presented here, we are hoping we were able to help you find that out. Do you already own a Samsung Galaxy S8 Active? How was it? Care to share? Want to unlock your Samsung Galaxy S8 Active from T-Mobile? We offer PERMANENT UNLOCK using your phone’s Device Unlock App. The LG Stylo 4 was recently released by MetroPCS, although it was first rumored to be a part of T-Mobile. LG had released a lot of phones lately, including the LG Stylus Series, and many users are confused whether they should upgrade to that or this specific model. The LG Stylo 4 is valued $239 in MetroPCS but they’ve cut it down to $179 as an in-store credit (discount). It is also being offered by Cricket Wireless and it retails at $229.99. There are a lot of offers from MetroPCS now, including a FREE iPhone SE when you SWITCH, but new things always fascinate us. And besides, who wants an expensive iPhone that is clearly a downgrade of Apple’s earlier versions? LG Stylo 4 is the total definition of an “up” game from LG. This year, the Seoul-based tech giant geared into increasing screen size to stand out from other major competitions that are already competing in the 6 inches arena. The LG Stylo 4 stands gigantic at 6.2 inches and the iPhone SE will look like a midget standing only 4.87 inches tall. Other 2018 mid- range phones like the Samsung J7 Prime stands only 5.5 inches, while the previous version LG Stylo 3 Plus stands 5.7 inches. This year, LG is trying to break through the mid range barrier by proving that size really matters, and the LG Stylo 4 does a very great job at standing out, and well, standing tall. The Stylo 4’s huge screen full-vision display really needs a big battery, we are yet to hear the reviews of battery life on this one just because it’s pretty new, but it is disappointing that it only has a 3300mAh battery, only slightly larger than the previous version Stylo 3 Plus which has 3200mAh. Still on this latest series, LG is trying to bring people the comfort of having a phone with a stylus, that is commonly known to be an arena for the Samsung Galaxy Note series. The LG counterpart is nowhere near half the price of any Samsung Galaxy Note phone but it sure is more than decent for its price. It also has a built-in stylus and has an updated software for you to take notes and create GIFS conveniently. Just like the usual mid-range phone, the Stylo 4 has enough machinery to compete- 2 GB RAM, 32 GB ROM, runs on Android 8.1, and an octa-core Snapdragon processor. You’d love the fact that at such a low price point it already has a fingerprint processor- that is definitely one step ahead the competition. Well done, LG. 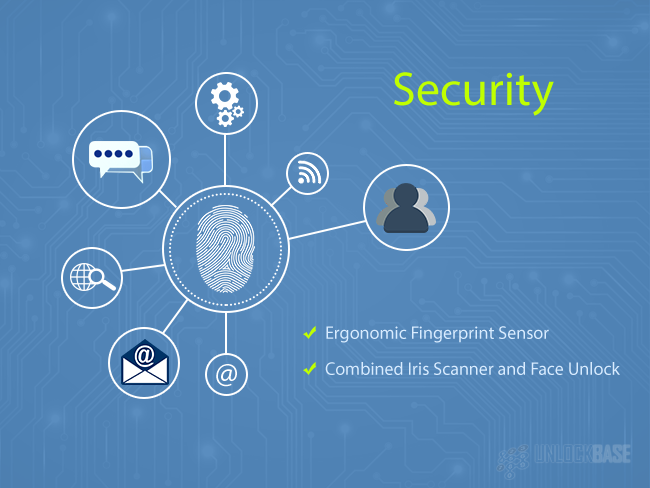 The fingerprint sensor also acts as a quick access button that is programmed to several features. It has facial scan, but of course, that is not going to win against the iPhone X. It also charges fast through a reverse USB type C charger, so that’s a big plus for the LG Stylo 4. The cameras aren’t bad but they aren’t great either. 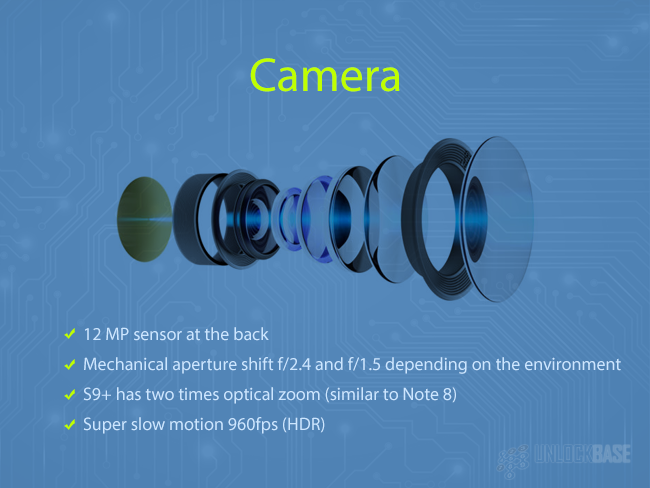 The main camera is 13MP and the front camera is 5MP with wide-angle lens. There’s a Portrait mode that lets you blur your background like a DSLR trick, but since the images are gradient at night, that trick is not going to work. There’s more to the camera than insta-perfect pictures, because with the QLens feature of this phone, you can use your captured images to search for something online. But then again, that isn’t something new. As for the audio, it has a DTS:X Surround sound feature, not sure if you’re the audiophile type that notices the sound difference no matter how little, but boy are the speakers awesome. For a mid-range phone, the LG Stylo 4 really cuts it to the budget. For a budget phone, it already has enough features that is necessary for security and good performance. And yet, LG decided to go beyond that and they’ve improved so much since the LG Stylo 3 Plus. We’re hoping LG makes more of these and keep improving them year after year, but we don’t think the consumers are ready for a drastic price increase, though. Bottomline is, LG Stylo 4 is a great phone for those who are in a budget. If you bought one from MetroPCS and want to use it with other providers, UnlockBase can help you Unlock LG Stylo 4. There is nothing more useful than a phone that can be used in multiple networks, wherever you are in the world. That’s it for the LG Stylo 4. Do you think we missed anything? Got any reviews for LG Stylo 4? Tell us about it and comment down below! After Apple’s release of the iPhone X, tech geeks always thought Samsung would come up with something as explosive and grandiose as that of the iPhone X, and that everyone thought of phones that are “foldable” coming from Samsung. The tech giant already admitted that they are far from making that possible on the Samsung S9, but we are still lowkey expecting something that spectacular is going to happen. Nonetheless, Samsung S9 is still a commendable phone with commendable features. Looking at it at first glance would make you think it is just like its predecessors Samsung S7 or S8, but it is definitely a notch higher than these phones. You are probably wondering whether you should upgrade to the S9 or if it’s better for you to just wait and save up for the much grander Android coming up later this year (who knows?). However, Samsung S9 is considerably one of the best phones available in the market today and it has the best specs we expect from a flagship so far. 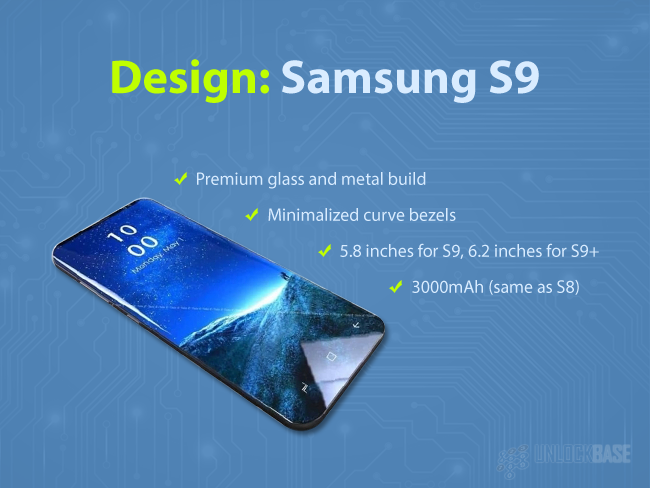 The Samsung Galaxy S9 may look like only an upgraded version of the S8 but it has a more advanced and capable hardware, which can greatly help preserve the battery life, and it also has a more ergonomic design and user interface that adds convenience and character to the flagship phone. However, if you don’t own an S8 or S8+ yet and you plan to own a Samsung flagship next, you are better advised to settle with the S8. With the S9 coming in the shelves to replace the S8, the prices are surely going to go down as service providers are sure to offer big discounts and deals on the previous flagship. 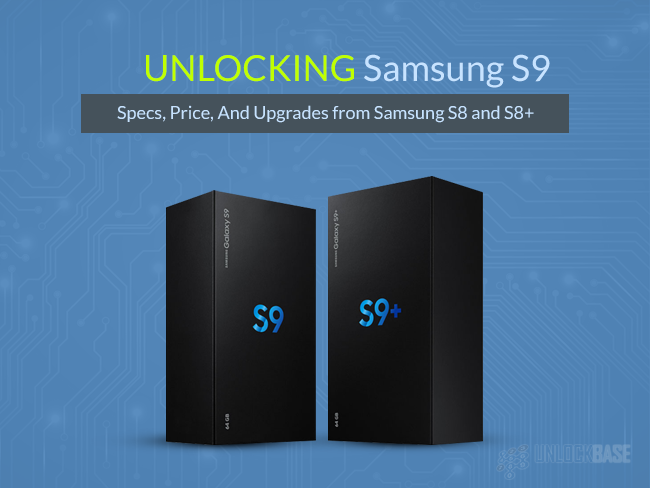 Also, an unlocked Samsung S8 is currently over a $100 less than the current price of the factory unlocked Samsung S9, and the price is surely going to go down a few more hundred bucks once the S9 takes off in the market and S8 is going to be replaced. We will compare both of the phone models in the sections below to help you know just what you are letting go when you choose the S8 over the S9. For the design, we’d like to say S9 is the winner. 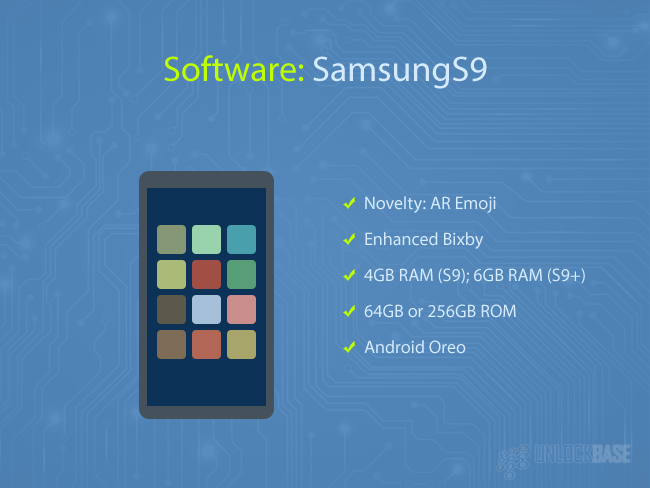 Although they look just similar, the Samsung S9 is a combination of customer inputs from the previous S- series phones that the company had gathered over the years. S9 still has a 5.8 inch Infinity Display, which is practically the same size with the S8, except that there’s a slight difference on how they designed it. The infinity display on the S8 goes edge-to-edge, that it is almost impossible not to accidentally press the screen and unknowingly open apps when you are merely just holding the phone. Although this design became a novelty with the S6 Edge, it was also quite annoying. Samsung got the public’s message (3 years later) and that’s why they had changed how the Infinity Display on the S9 looks like. Technically, it is still edge-to-edge except that the curve on the sides is no longer part of the screen. Samsung S9 looks like a typical 2017 phone; it’s bezel-less and gargantuan in size. We are not sure if the Samsung S9 design is going to be a trendsetter this year, since it’s the first flagship phone to come out this year. Aside from the screen, the S9 also has a more ergonomic placement of the fingerprint sensor. You can easily reach for the fingerprint sensor and it works quite fast as well. We consider this a smart move from Samsung because Apple didn’t keep the Touch ID- which many iPhone fans didn’t like. Samsung also tried to enhance their Face Unlock by combining the Iris Scanner, which they termed as the Intelligent Scanner . The intelligent scanner works in the same way as that of the iPhone Face Unlock, however, it uses two different biometric data simultaneously. There were no issues about the Face Unlock with the Samsung S9 as it is smart enough to deny an unlock using a photo. The security seemed very perfectly tailored, the only caveat is that you can only unlock the phone at a certain angle as the phone needs to scan your irises clearly for it to unlock. Unlike the iPhone X which can unlock your phone from multiple angles, the Samsung S9’s Intelligent Scanner doesn’t have 360 degree view to detect your face from any angle. This results to a rather awkward and unnatural way of unlocking the phone, but we are hopeful that Samsung will be able to improve this feature on the upcoming models. 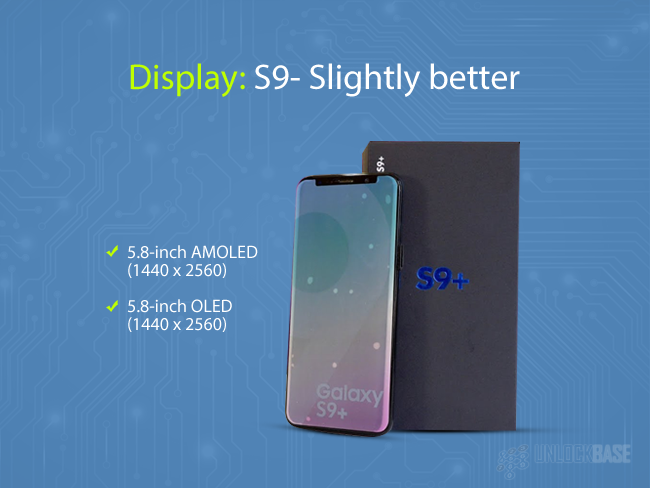 Samsung s9’s display is slightly better than that of the S8. It still has an AMOLED screen + HDR for better video quality- pretty much the same specs. The S9 also has a brighter screen and it performs better than its predecessor. Samsung is keeping the headphone jack despite the ditch-the-headphone-jack trend that other phone manufacturers are doing. Apple did it first and now phone manufacturers such as Sony are following the tracks and replacing the headphone jack with a USB type C of audio hub. That certainly doesn’t invite the audiophiles who loves immersive music they can only enjoy with a headphone. That’s one ball in the basket for the Samsung S9. 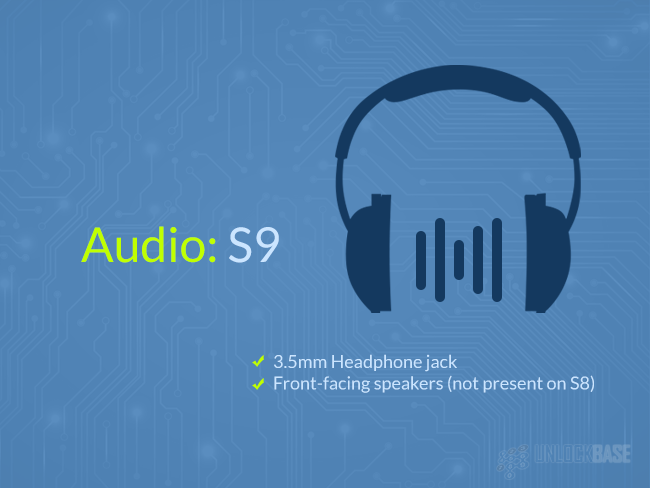 Also, Samsung S9 now has front-facing speakers which also improves the way sound gets out of the device. The S9 also has an improved camera, with two different apertures that shifts mechanically depending on the light. That ensures you can have awesome images both in high and low light and especially useful such as when taking images at night. Aside from mechanical aperture shift, the Samsung S9 also has a super slow motion feature just like that of the Sony Xperia XZ Pro, and at 960 frames per second, you are sure to get awesome videos out of a mere second in your life. It seemed like Samsung went all out with their camera this year, because the Samsung S9 also has two times optical zoom which is similar to last year’s flagship Galaxy Note 8. Combine these awesome features and you have an amazing camera phone that you can take with you day and night. It’s no surprise that the Samsung S9 has an IP68 level of water resistance as what the previous models have. What’s surprisingly awesome this time is that Samsung S9 runs on the best chipset available to day, Snapdragon 845. The Samsung Galaxy S8 runs on a Snapdragon 835 headset, which as the numbers suggests, is a second-rate chipset compared to the new one. The super fast chipset is expected to help the Samsung S9 save and manage its battery life for longer use. With an efficient chipset onboard, multitasking on this phone will not only be seamless, it will also be power efficient. Samsung may have been short of time when they created the AR Emoji as it clearly seemed like a rush development. It’s easy to assume this is how Samsung claps back on the Animoji of the iPhone X, but it wasn’t a bad try. On the other hand, Samsung runs on Android Oreo, which is the latest version so far, and for that we give Samsung a thumbs up. Samsung S9 is also available on two different memory capacity versions 64GB or 256 GB and that means you can store a whole lot of data on this one. While that is not a new thing, it’s sad to note that the Samsung S9 only has 4GB RAM, and only the S9+ has a 6GB RAM capacity. That’s a pretty clever marketing tactic right there, but we’re not sure if the Samsung S9+ can rely on that alone to sell. Although there was clearly no novelty on the Samsung S9, it is surely a sophisticated and convenient upgrade to that of its predecessors. Samsung finally applied the rules of constructive criticism among its flagship products, and they made the Samsung S9 almost infallible in every angle. They can do better with the AR Emoji and the Intelligent scanner, though.